In a time where a man with multiple allegations of sexual assault against him can become president, it’s crazy to think that thirty years ago another man’s presidential campaign could come crashing down so easily because of adultery. In 1987 Gary Hart was considered the frontrunner for the 1988 Democratic Party presidential primaries, but withdrew from the campaign a week after news broke of his alleged affair with his mistress, Donna Rice. George H.W. Bush went on to win the 1988 election for the Republican Party. Hugh Jackman and Jason Reitman are perhaps not the team you’d expect for such a film; a non-American playing a presidential hopeful, and a director/writer known best for somewhat obscure intimate character studies (Juno, Young Adult, Tully). This time, with The Front Runner, Reitman has teamed up with a couple of screen-writing novices with political backgrounds: Matt Bai, author of the book on which the film is based, All the Truth is Out, and Jay Carson, former press secretary for Hillary Clinton. The result is a film that raises interesting questions without offering any easy answers. It feels as if this trio were keen to present the everyday goings-on of a presidential campaign as realistically as possible. In various scenes we are offered a fly-on-the-wall look, with multiple conversations going on at once between many characters. It creates a chaotic vibe that feels like a genuine representation of what happens behind the scenes of a campaign, but it makes for a rather irritating experience when as a viewer you find yourself struggling to listen in to what’s important in the scene. Similarly, there are a large number of supporting characters to keep track of, and we only get a short amount of time with each one. Most of these exist purely as cogs in the machine of Hart’s campaign (campaign employees and journalists); for the most part we see little of their lives outside of this. The film does succeed, however, in demonstrating how so many people’s livelihoods depended on this one man. While Gary Hart was, at least up until the point where his affair was exposed, viewed as a charismatic man, he is for the most part a rather unlikeable character in the film. It’s surprising that someone as likeable as our Hugh could achieve this, and this proves what a strong actor he is. While his Hart does exude charm out on the campaign trail, his anger and steadfast denial when in the presence of his minders and the press shows a very different character. It is only in the scenes with his betrayed wife where he becomes a quiet and contemplative man. The most notable supporting characters are the women in Hart’s life – his wife, Lee (Vera Farmiga), daughter, Andrea (Kaitlyn Dever), mistress, Donna (Sara Paxton), and campaign scheduler, Irene (Molly Ephraim). Irene is tasked with minding Donna while Hart’s team figure out their next moves, and is affected after forging a bond with her and contemplating how the scandal will impact on her future. Monica Lewinsky comes to mind while watching some of these scenes play out. Lee and Andrea are also victims of Gary’s scandal, with Lee telling him upon his half-hearted admission, “The one thing I ever asked was don’t embarrass me”. 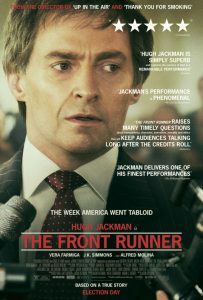 The Front Runner poses some very thought-provoking questions of its audience: namely, do politicians have a right to privacy, and does adultery mean a person is unfit to lead a nation? After the story has broken, a journalist (Mamoudou Athie) questions Hart about his morals and in true politician-style, he sidesteps the question. The film does not appear to give more weight to any particular side of the argument, which may be frustrating for some viewers. What remains most bewildering, however, is that an affair could mean the end to a man’s political career back in 1987, but in 2016, just repeat the words “fake news” to a specific audience and you can get away with anything. This review was first published on 29th January 2019 at Film Blerg.